A pair of playoff series that have been treats for us WNBA lovers to watch were simply too good to not go the distance. That is what will happen on Tuesday when the Washington Mystics face the Atlanta Dream and the Phoenix Mercury do battle with the Seattle Storm to decide which two teams will face off in the 2018 WNBA Finals. One cannot put our fingers on it, but something was different with the Mystics in Game 4. Something – perhaps—that was sorely missing in Game 3. That person that was dearly missing for Washington in Game 3 – Elena Delle Donne – was somewhere to be found in Game 4. More specifically, on the court. 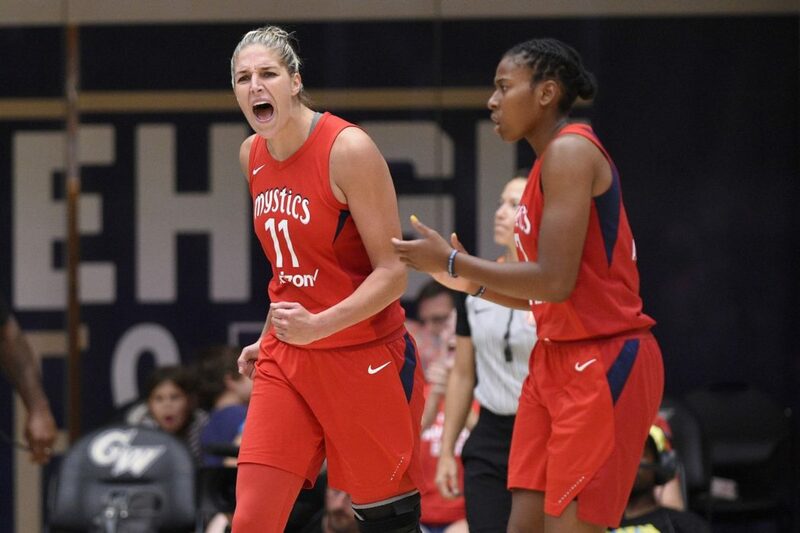 Delle Donne’s 15 points and 10 rebounds provided a huge boost to a Washington team that appeared to play with more energy on both ends of the floor with No. 11 back in a jersey. The Mystics were also the beneficiaries of 22 points from Kristi Toliver who also drained four of nine shots from behind the arc. Aerial Atkins also had 19 points and made all five of her free throw attempts. Natasha Cloud had 13 and LeToya Sanders had 10. Tierra Ruffin-Pratt also added 11 to Washington’s efforts off the bench. Four for Atlanta all had 12 points – Brittany Sykes, Jessica Breland, Renee Montgomery, and Tiffany Hayes. Alex Bentley and Monique Billings also chimed in with 11 points each off the bench. Seven of Billings’ 11 came from the free throw line. In the second half, the Dream managed to cut its deficit down to five, but Washington won this one in the fourth quarter. The Mystics outscored the Dream 25-15 in the contest’s final frame. Delle Donne played the second-most minutes of any Mystics player in her first game back from the knee injury. Her 34 minutes trailed only Toliver’s 36. At Talking Stick Resort Arena in Phoenix, the Mercury down the stretch looked like a team that was playing with their season on the line. Phoenix managed to score an 86-84 victory over the Storm, forcing a Game 5 back at KeyArena in Seattle. The biggest plays of the game, in a contest that ended up being this close, occurred in the closing seconds. On the Mercury’s last possession, a DeWanna Bonner miss became a Camille Little offensive rebound. She passed the rock to Brittney Griner whose two-pointer made it an 86-84 game. The Storm’s final offensive possession was drew up by Sue Bird, who was on the bench with a nose injury she sustained earlier in the game, but Seattle did not even get a shot off. Bird’s injury came after being unintentionally elbowed by Breanna Stewart earlier in the contest. The Storm’s floor general had to be assessed by medical staff when returning to the locker room. Despite her presence on the bench, she would not return for the game and it is yet to be determined as to if she will be available for Game 5 back in the Emerald City. Sans their veteran point guard, it was up to other Storm players to step up, but some onlookers believed that the circumstances surrounding the injury may have rattled Stewart, a third-year player on the cusp of her first WNBA Finals. Prior to that, the Storm looked as if they could not miss, including taking a 31-16 lead after the first quarter. A huge factor in that was Seattle’s proficiency and accuracy in hitting three-point shots. One had to believe that the Mercury had a run in them – and they did. An important frame for Phoenix was the third quarter, when DeWanna Bonner scored a good chunk of her 27 points. Griner, who had the game-winning shot, finished with 29 and Diana Taurasi had 16 points. Griner also added 12 rebounds to her evening. Briann January had nine points in 38 minutes of play. For the Storm, Stewart was their leading scorer with 22 points. Natasha Howard had 14 and Alysha Clark finished with 13. Jewell Loyd, who was held to only two points and one-for-10 from the field in Game 3, had a better outing in Game 4 with 11 points. A pair of Game 5’s going up….on a Tuesday.